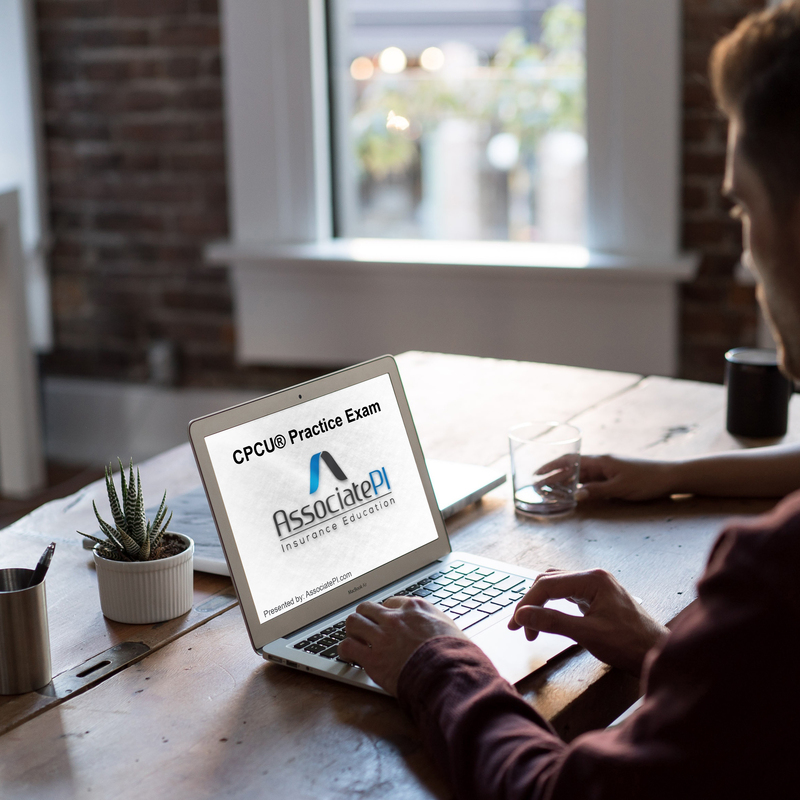 The CPCU® 520 exam questions, similar to the CPCU® 500 exam questions, require you to fully understand and apply every minor detail of the CPCU® 520 topics. When I say you must be able to apply your knowledge from these topics, I mean these questions will put you in the shoes of an insurance professional; it will be your job to analyze each question in order to select the best answer for the given scenario. You will NOT be simply repeating a definition. 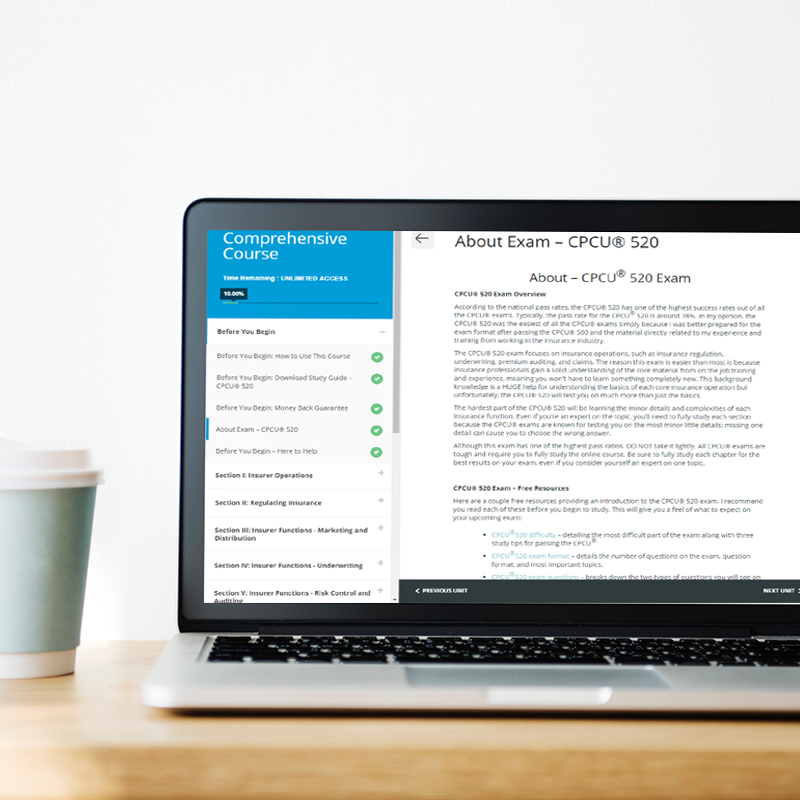 If you’ve already passed your CPCU® 500 exam, then you’ll have no problem with the CPCU® 520 exam format and question types. The CPCU® 520 questions will be formatted in a similar manner to the CPCU® 500 exam. Remember these questions are tricky; the hardest part will be staying focused and fully reading the question in order to select the best answer. The CPCU® 520 exam consists of 75 multiple choice questions broken up into two sections, part A and part B. Part A: Concept questions – The first section of the exam will be approximately 49 concept questions; these questions will test your understanding of a definition or topic. The multiple-choice answers will generally provide 2 or 3 partially correct answers and one “best” answer. Part B: Case questions – The second section of the exam will be approximately 26 case questions; these questions will require you to apply your knowledge to a specific scenario or event. You will be given a real-life scenario; your job will be to select the best recommendation to solve the given scenario. 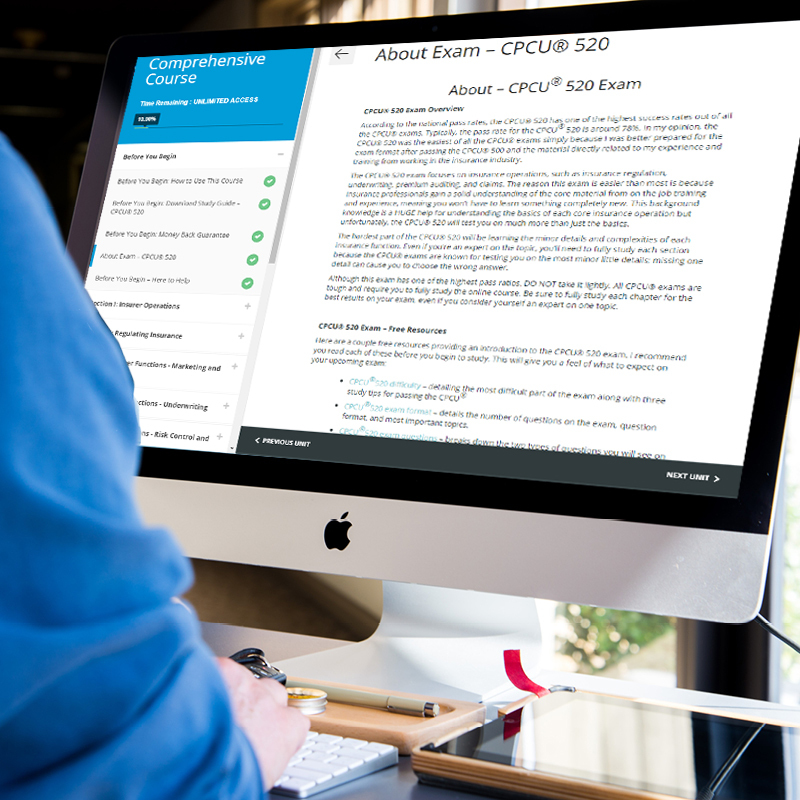 For more info about what to expect on the exam, see our blog about the CPCU® 520 Exam Format. According to nationally published CPCU® pass rates, the CPCU® 520 historically has one of the highest success rates out of all the CPCU® exams. 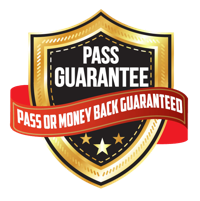 The pass rate is typically around 78%. In my opinion, the CPCU® 520 was the easiest of all the CPCU® exams simply because I was better prepared for the exam format after passing the CPCU® 500 and the material directly related to my experience and training from working in the insurance industry. For more insight, see our blog about the CPCU® 520 Difficulty. Below we are outlining some important CPCU® 520 exam topics. We recommend you master these topics before attempting the CPCU® 520 exam. This is our opinion of the topics that are important on your exam. Reinsurance – we recommend you heavily focus on reinsurance, in our opinion this is one of the most important topics of the CPCU® 520 content. Understand the reinsurance process, calculate how much the reinsurer will pay for a loss, and know the best reinsurance contract for an insurer given a specific scenario. Marketing – we highly recommend you master the topics of insurance marketing and distribution. Know the best distribution system given the characteristics of the customer and insurer, understand the characteristics of each type of insurance customer, and know the difference between an agent and broker. Risk control – risk control and premium auditing is an important topic. Make sure you know the reason for premium auditing, reason for risk control, and types of premium audits. For more info about the most important topics see our blog about the CPCU® 520 Exam Topics. 1) Read the entire online course and focus on the details: This is by far the most important tip. As mentioned above, you’ll probably have a general knowledge about each insurance operation but it’s the minor little details that will cause you to fail. 3) Practice, practice, practice: Take as many practice exam and quizzes as you possibly can. This will help you familiarize yourself with the CPCU® 520 question format and help you determine which topics you need to re-study. Once you go through a few practice quizzes and exams, return to your notes and review any section that you failed. For more information about the type of questions you will see on the exam see our blog about the CPCU® 520 Exam Questions.